*Zero reading at .03 microns for particulate matter coming from HEPA/exhaust filter, according to our Electronic Handheld IQ Air Particle Reader. As good as Miele Vacuums! Start breathing healthier air with the new Electrolux EL500AZ Oxygen Ultra PlasmaWave air purifier. 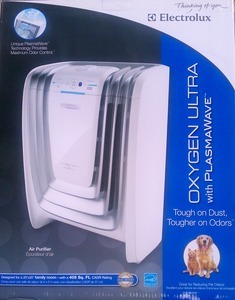 The Electrolux EL500AZ Oxygen Ultra PlasmaWave is the ideal air cleaner for people living with asthma or allergies. Featuring 3 levels of purification that create a complete air cleaning system, the EL500AZ Oxygen 3 captures up to 99.97% of airborne dust, allergens, and even odors in areas up to 403 square feet. With the new Electrolux EL500AZ Oxygen Ultra PlasmaWave air is first filtered through a carbon pre-filter, then through a True HEPA filter, and finally through the patented PlasmaWave. The Oxygen Ultra air cleaner comes with a remote control and sensors that automatically sense odors and adjust the fan accordingly. This air purifier is also amazingly quiet: when set to Sleep Mode, the EL500AZ Oxygen ULTRA produces a sound level of only 26.0 dB and dims its lights for a peaceful night's sleep. Stylish and ultraquiet, their air cleaners are designed to help you obtain cleaner indoor air. A three-stage air filtration process works to automatically detect and eliminate odors and airborne allergens so you can enjoy a healthier living environment. Three-Stage Filtration: Charcoal, HEPA and Plasmawave Technology. Easy to maintain. Automatic Sensor. Just Set it and Forget It. PlasmaWave Technology uses positive and negative ions to remove odor causing airborne pollutants. Filter Indicator Light on the front of the display panel. You know exactly when to replace your filters. Reset button beside the light makes the red light go off after replacing filter. Remote Control Fits in the Depression on Top of the unit. You always know where it is. As the filtered air exits the unit, it passes through a corona discharge (a type of electric pulse), creating both negative and positive ions (plasma). When plasma combines with water vapor in the air, hydroxyls are formed. These hydroxyls bond with and neutralize remaining airborne pollutants - including viruses, chemical gasses, bacteria and germs. The Odor Sensor will sense foreign odors in the air and automatically adjust the fan speed according to the cleaning level required. Everything you described about the purifier was exactly what I needed. Thank you!